9 Aug : The oil spill from Panamanian ship MSC Chitra, which ran aground off Mumbai harbour after Saturday’s collision with another vessel, has stopped, the Coast Guard said on Monday. “The leakage of oil from the ship has stopped on its own,” S P S Basra, IG Coast Guard (Western Region) told a news agency. “It is observed that in the last six hours, the fuel from the ship tank has stopped coming out. So, it is a relief kind of a thing,” Basra said. Oil was leaking from two of the 12 tanks of the vessel which had got damaged due to the collision. The two tanks could together hold 879 tonnes of oil, sources in the Coast Guard said. Concerned over the oil spill following collision of two cargo ships off Mumbai coast, Prime Minister Manmohan Singh on Monday called for a report from the Shipping Ministry on the incident. The Prime Minister has called for a preliminary report from the Shipping Ministry on the oil spill. 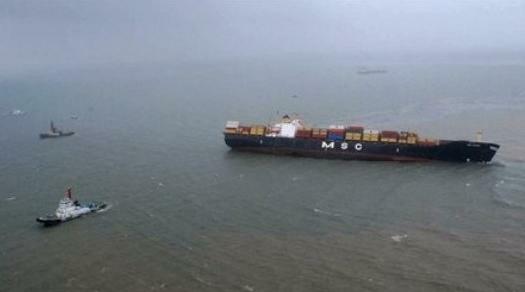 Two Panamanian cargo ships – MSC Chitra and Merchant Vessel Khalija – collided off the Mumbai coast causing an oil-spill from one of the vessels. The issue was also raised in the Rajya Sabha where Environment Minister Jairam Ramesh said legal action has been initiated against owners of the two vessels. Government on Monday said legal action has been initiated against owners of the two cargo ships, which collided off Mumbai coast resulting in oil spill endangering the marine life and environment. “Maharashtra State Pollution Control Board has already initiated legal action against the owners of the ships,” Environment Minister Jairam Ramesh told Rajya Sabha during Zero Hour while responding to members’ concerns over the issue. He said the government would make a detailed statement on the issue in Parliament on Tuesday. Raising the issue, Shantaram Luxman Naik (Congress) said the incident has put the fishing community of the area in “deep trouble” and asked why there is not even a preliminary statement from the concerned authority. “Those responsible for the collision of two vessels in Mumbai sea should be arrested….Till today why no arrests have been made? If two motor vehicles collide, the drivers are put immediately behind bars,” Naik said. He also expressed surprise as to why there was no traffic management in the area and said thousands of litres of fuel have spilled into Mumbai sea posing a serious threat to environment. He demanded that the Mumbai authorities should take the task of grounding the ship expeditiously with minimum spillage of the oil. “The damage will be far more if it is not salvaged soon,” he added. The minister assured the member and the House that the Coast Guards and state pollution board officials are at the site. Ramesh also said that immediately after the incident, he established contact with the state pollution board and Coast Guards. Rajiv Pratap Rudy (BJP) said people affected by the oil spill should be given compensation.